The 2019 Toyota 4Runner is a 5 passenger Automatic transmission, 2 Wheel Drive Sport Utility Vehicles or 4x4 Sport Utility Vehicles. It is available in 7 trim packages, the Limited, Limited Nightshade, SR5, SR5 Premium, TRD Off Road, TRD Off Road Premium, and TRD Pro. 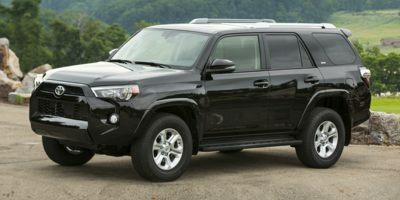 The new Toyota 4Runner invoice price ranges from $32,302 to $43,422, while MSRP ranges from $35,110 to $47,200. The 2019 Toyota 4Runner is available in 8 exterior colors, Barcelona Red Metallic, Blizzard Pearl, Classic Silver Metallic, Magnetic Gray Metallic, Midnight Black Metallic, Nautical Blue Metallic, Super White, and Voodoo Blue, and 3 interior colors, Black Graphite, Redwood, and Sand Beige.